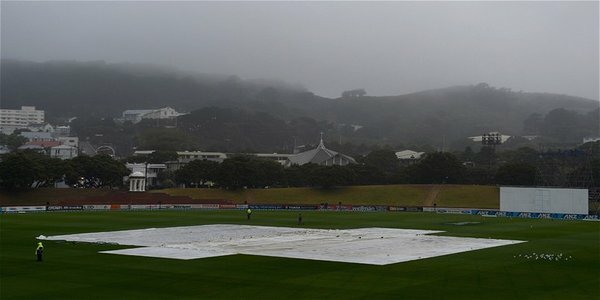 NEW DELHI: Rain stopped play in the second one-day international against India at Seddon Park in Hamilton. Earlier, Indian captain MS Dhoni won the toss and chose to bowl as the match began under the threat of rain at Seddon Park. New Zealand were 170/2 in 33.2 overs with Kane Williamson and Ross Taylor at the crease when the play stops. New Zealand lead the five-match series 1-0 after winning at Napier by 24 runs. New Zealand made one change, naming veteran seamer Kyle Mills to replace Adam Milne who has a strained abdominal muscle. Kane Williamson hit a 52-ball 50 soon after Suresh Raina had Martin Guptill caught by Mohammed Shami at short fine-leg. Guptill hit a six and five fours in his 65-ball 44 before falling to Raina. Shami gave India the first breakthrough by dismissing Jesse Ryder in the sixth over at the score of 25. Ryder made a promising 11-ball 20 before getting caught behind. India: Mahendra Singh Dhoni (Capt. ), Shikhar Dhawan, Rohit Sharma, Virat Kohli, Ajinkya Rahane, Suresh Raina, Ravichandran Ashwin, Ravindra Jadeja, Bhuvneshwar Kumar, Ishant Sharma, Mohammed Shami. New Zealand: Brendon McCullum (Capt. ), Martin Guptill, Jesse Ryder, Kane Williamson, Ross Taylor, Corey Anderson, Luke Ronchi, Nathan McCullum, Kyle Mills, Tim Southee, Mitchell McClenaghan.